Okay, so my husband was laughing at me as I took these pics of these M&M's, but really, I had to post about them. The are a little-known treasure hidden up on the top shelves in Target stores across the country. 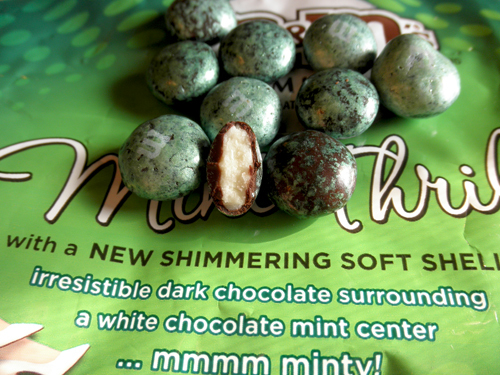 Anyone who loves minty chocolate really has to try these gems. Just look at them; they're even shiny, for crying out loud! This is one of those items that has actually gotten that SNL Target cashier comment: "Oh my gosh! I haven't seen these! Where did you find them? I need to get some of those!" The shells on these are not like your typical M&M. No, they have a barely perceptible crunch to them, due to the metallic green coating. (Yeah, probably not good for me, but I don't care with these.) 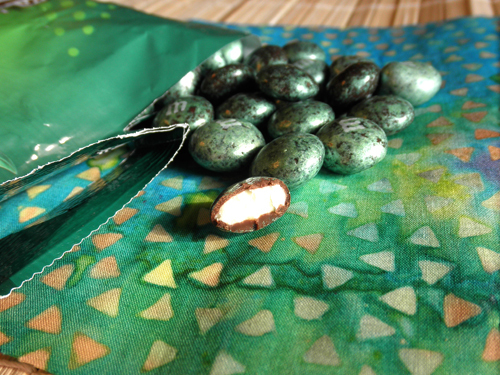 The minty chocolate interior is soft and smooth, and very minty. I shouldn't buy them as much as I do because I can't just eat a couple. I eat a couple of handfuls. So, go on out to your local Target to the chocolate aisle and look on the top shelf. They're worth the trip AND the calories. Trust me. *Update. Bad news. I can't find these Mint Thrills anywhere now. I went to the M&M's website, and it looks like they're still making them. Amazon has a pack of 4 8.1oz bags for $29.99. Yikes! I'll have to research this further, and perhaps write a letter to our friends at M&M/Mars. You are so right! I just discovered them myself and I am completely addicted to them. Unfortunately, only a few stores seem ko sell them. I used to buy them at Target but cannot find them there anymore. Where else are they available. Oh no, Anonymous! I hate it when Target does that! I don't know where else to get them. I think Walgreens has the smaller package of them, but I haven't looked for them there in a while. I will keep my eyes open. Don't panic. . . but I bought some at a Target just north of NYC, and a sticker on the bags said "Clearance." I bought a lot of bags. A few weeks later, I can't find them. I fear that they MAY not be available anymore. I hope I'm wrong. OMG, I too am addicted to these m&ms and have gone to more then 4 Target's and can not find them anymore either after "clearance" was on the multiple bags I bought:( Sooooo said I LOVE these things. Probably best for my wasteline though but, DAMN!!! !